Over the next couple of weeks I will be posting about things that I personally do, over the course of my normal busy life, to fit in healthy habits. I am not doing this to show you my awesomeness – although I hope that you do think that I am awesome – but to show you that it’s not always polished or pretty but it is possible! Today is Nathan’s last day of preschool. His school gets out pretty early, it’s not even Memorial Day yet! This day creeps up way too quickly for me. I am not the mom who is sad to send her baby to preschool. Maybe there is something off in my wiring but the idea of preschool makes me excited beyond belief. I was so thrilled to send him to school this year. And it’s not even really that much school. This year he went to school two mornings a week for three hours each. Considering the travel time to drop him off and pick him up, it was about 2.5 hours of no kid time. So, it has been really important to me to use this time as efficiently as possible. Since having kids, I have formed this habit of keeping a mental tally of “thing I can do while their around” and “things I must do when they’re not around”. There are sometimes sub-categories like “things I can do when they’re sleeping” or “things I can do when they’re playing in the backyard but can not do when they’re in the kitchen”. This habit has become even more essential to managing my time as I work from home with a 3 year old in the house. Preschool time is precious time! I often feel the pull to work the whole time he is at school. Sometimes I do just that. But I also really like to fit a workout in. This is a constant dilemma on preschool days because there really isn’t that much time to play with. My gym is between preschool and home, which is convenient and I generally opt for a 30 minute class vs a longer workout so that I can get home and get a few other tasks done before I have to head back and pick up my little darling. This way I feel good and accomplished but I haven’t used up the entire time doing only one thing. Today, I opted to skip the gym and workout at home. I love my gym classes too, but today I was going for quick. I can make it home by 9:15 but the class at the gym doesn’t start until 9:30. When it’s preschool time, minutes matter! And since it’s the last day, I was going to milk every single minute. 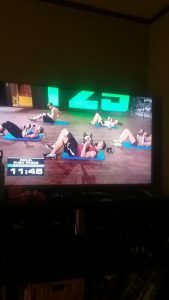 I did a T25 workout which is short, intense total body workout with very little rest time. I love it because it’s super quick but I feel like I have worked hard. I started it as soon as I got home (and I did pause it to grab some water and take a picture!) and was done by about 9:45. This still gave me some time to take a record fast shower and get my “no kid” tasks finished before it was time to head back to preschool. Preschool days are good days because, not only is he gone for a few hours, when he comes back he’s tired and happy to chill out on the couch for awhile. I love preschool and I am super sad that it’s done for the summer. It just means it’s time to adjust and add to the “things I can do while he’s chilling out on the couch” list. Short, intense workouts like this are perfect!